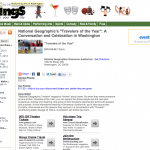 As we mentioned last week, Booker and a few other Travelers of the Year have been asked to visit DC and participate in National Geographic Live!, a panel discussion in front of a live audience. We couldn’t be more excited to meet the other travelers and hear what inspires them to go out and see the world. 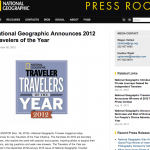 We also look forward to meeting Traveler Contributing Editor George W. Stone, who will be hosting the event! For more information and tickets to purchase HERE. Take a look at the links below to read more about this exciting event.